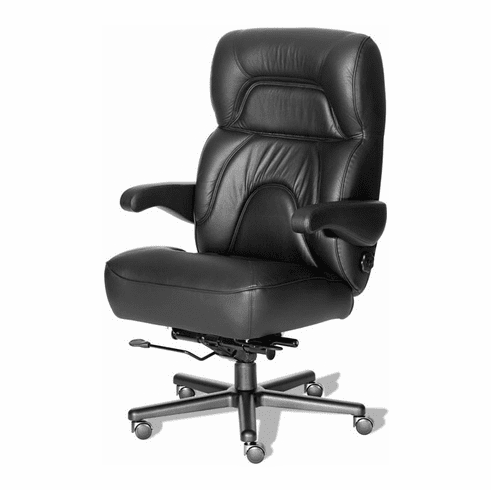 ERA’s Chairman oversized executive chair is THE CHAIR, man! Sorry, we couldn’t resist…. Seriously, this is the perfect chair for the large executive. It’s rated for 500 pounds, and approved for 24-hour use. It’s also packed with all the features you need, including four-way adjustable lumbar support, rocker reclining seat back, adjustable seat depth and pneumatic seat adjustment. The base is heavy-duty aluminum for the ultimate in stability, and the flip-up arms make it easy to get in and out. If you’ve ever felt that manufacturers of office chairs don’t care about large people, you’ll change your mind once you sit in this chair. It’s not only functional, but it’s also very attractive, in a wide range of fabrics, vinyl, vinyl/leather combinations, and even a full leather option. And it’s backed by a lifetime warranty!